Friends of Bushwick Inlet Park are rallying on Sunday in hopes of pressuring the city to finish building park space on the Williamsburg waterfront. WILLIAMSBURG — Dozens of locals are expected to invade the Williamsburg waterfront Sunday — both on land and in the water — demanding that the city fulfill its promises to complete the Bushwick Inlet Park. Williamsburg and Greenpoint residents have been rallying for months, asking that Mayor Bill de Blasio follow through on the city's promise to create nearly 30 acres of park as part of the waterfront rezoning plan. But the Friends of Bushwick Inlet Park and elected officials still haven't heard word from the mayor's office, said Steve Chesler, an organizer of Sunday's event. They're going out again on Sunday to "Occupy the Inlet" in hopes of putting more pressure on the city to make moves before sale of the CitiStorage land parcel is finalized. "We’re getting angrier. Our base has been growing," Chesler said. "We’re not going to relent until the administration starts talking about it and engaging our reps in the community." The Parks Department has moved forward on many of the promised parcels for green space along the Williamsburg waterfront. This summer, it's spending $50 million to finish acquiring a piece of land called the Bayside Parcel and another $22 million to complete demolition on the side. But the city has yet to make moves on acquiring the 11 acres of land where the CitiStorage building is as it focuses on the Bayside land. "NYC Parks continues to take substantive steps toward the completion of Bushwick Inlet Park, which will bring more public green space to the Williamsburg-Greenpoint waterfront," the Parks Department said in a statement. 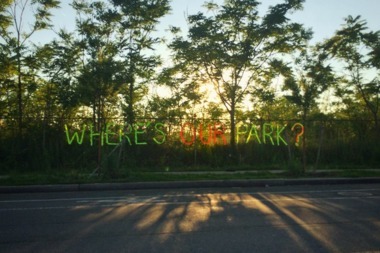 The mayor's office referred inquiries to the Parks Department. A Parks spokesman said they've been engaging with the community, by answering questions from councilmembers and meeting with the Open Space Alliance. Mayor de Blasio has reportedly supported a plan where a private developer converts a portion of the CitiStorage land into park space — a path that park advocates reject. Crain's New York reported in May that two real estate investment groups have signed a contract to take over the land, which is zoned for manufacturing. Advocates hope that Sunday's rally will put more pressure on the city to get things going before a sale is finalized, Chesler said. Boaters will be in canoes, kayaks and other boats on the water in the inlet, while others will be on land with posters, caution tape and protest kites. "The park is being held hostage from us," Chesler said. "Occupy the Inlet" will take place on Sunday, Aug. 9 from 12:30 p.m. to 2 p.m., with a noon meetup at Kent Avenue and North 14th Street.